Aerodynamics addresses the kinematics of air, which is a type of fluid, as well as the influence of air on surrounding objects. Aerodynamic characteristics are important factors dictating the flight performance of aircraft and space vehicles during atmospheric re-entry. Since the days of the Wright brothers, wind tunnels have been effective and indispensable tools in elucidating these properties during the development of aircraft and spacecraft. Experiments using wind tunnels on the ground (Experimental Fluid Dynamics, EFD) have been essential parts of the preparation for manufacturing and flight testing actual aircraft. JAXA operates and maintains Japan's largest wind tunnel facilities, which boast a wide range of speeds and sizes. In fact, JAXA’s wind tunnels have been used to test most of the aircraft and space vehicles that have been developed in Japan. 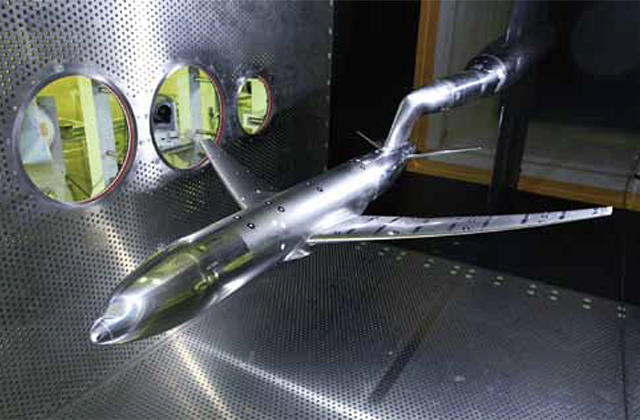 To provide higher-accuracy and higher-quality test data more efficiently by advancing wind tunnel technologies, and to assist in the development of technology for improving aerodynamic performance, JAXA makes continuous R&D efforts, thereby contributing to the growth of the Japanese aerospace industry and global competitiveness. In order to identify the exact sources of noises through noise source identification technology developed by JAXA which uses multiple microphones to identify the noise source, this study aims to improve the resolution of sound pressure distribution to which image processing methods were applied, and to develop technology for identifying aerodynamic phenomena which cause noise by simultaneously measuring noise and optics, and then linking the results of both measurements. The study also aims to develop technology for simultaneous high-accuracy evaluation of aerodynamic phenomena and noise. This study aims to clarify the decision mechanisms for vortex structures and shedding frequencies in the wake flows of axisymmetric objects (bluff bodies) at high Reynolds numbers, and to clarify the correlation between Reynolds numbers and back pressure which is closely related to the structure of wake flows. 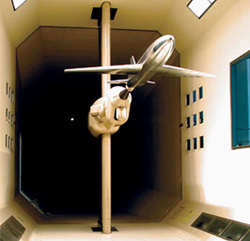 Furthermore, by utilizing magnetic suspension technology in dynamic testing for which suspension interference is most pronounced, the study will also devise a wind tunnel testing method which determines dynamic aerodynamic characteristics by examining how models of aerospace vehicles, including capsules, respond to excitation. This study aims to support re-entry capsule research by ensuring the necessary testing capabilities for predicting the wide array of aerodynamic characteristics that the phases of re-entry bring about. This study aims to develop a numerical analysis system which is capable of accurately predicting and evaluating aerodynamic performance and the heating environment in a wide array of re-entry stages, thus assisting in the development of planetary atmospheric entry vehicles. The DAHWIN system is the world's first full-scale hybrid EFD/CFD system capable of obtaining higher precision data more effectively by integrating the analysis of wind tunnel-based experimental fluid dynamics (EFD) with that of computer-based computational fluid dynamics (CFD), maximizing the respective benefits and compensating for the imperfections of each method. In order to position JAXA's 2m × 2m transonic wind tunnel as one of the world's top large-scale wind tunnels, this study aims to establish integrated technology that improves accuracy without hurting productivity and boosts productivity without negatively affecting accuracy. JAXA has been researching and developing three optical measurement technologies for wind tunnel testing: pressure measurement technology using pressure-sensitive paint (PSP), which changes color in response to the pressure acting on a test model; particle image velocimetry (PIV), which mixes microscopic oil particles into the flow to measure flow velocity; and model deformation measurement (MDM), which measures deformation and displacement of the wind tunnel model such as the wing bending caused by lift. FLIGHT PATH No.5/6 "JAXA's globally - competitive advanced wind tunnel technology"